My delicious, delicate free time projects. If you want to enjoy the taste of summer around the year, this is your syrup. Pick wild rose petals far away from the traffic. Do not wash them but try to avoid insects. Put the petals in a pot. Pour water to cover the petals. Measure and note how much water you used. Soak the petals for 2 days, press them with a plate to keep them under water. Stir occasionally. After 2 days add 5 g citric acid per liter to the wild rose-water. The petals will give out the wonderful pink color - it is magic! Let it happen for about 1 hour, stir occasionally. Filter the liquid through a sieve. Add 70 g sugar per liter and bring it to a boil. Cool it down, add Atamon (or other preservative) to the syrup and pour it in bottles. Posted in Preservation. 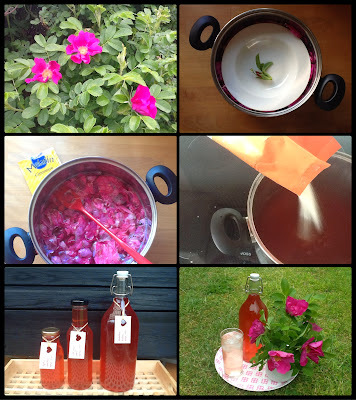 Tags: citric acid, petal, sugar, wild rose on 21/06/2014 by Maagedeli. The sunny smell of elderflowers belongs to early summers. 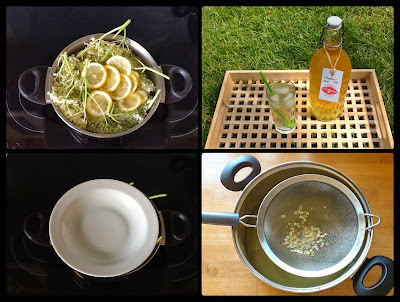 It is easily to save this wonderful aroma by making elderflower syrup. Pick flowers from elderflower bushes/trees far away from traffic. Do not wash them because you need the aromatic pollen, too. Put the flowers in a pot and add lemon slices. Pour water to cover the flowers and the lemon. Measure and note how much water you used. Soak the flowers for 2 days, press them with a plate to keep them under water. Stir occasionally. After 2 days filter the elderflower-water through a sieve. Add 70 g sugar and 15 g (about 3 teaspoon) citric acid per liter and bring it to a boil. 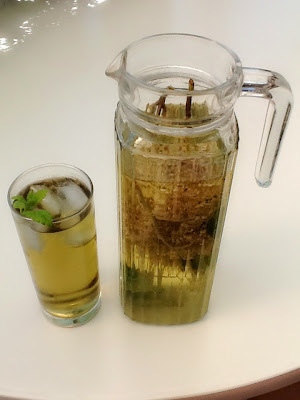 You can make ice tea of fresh elderflowers, ginger and lemon balm. 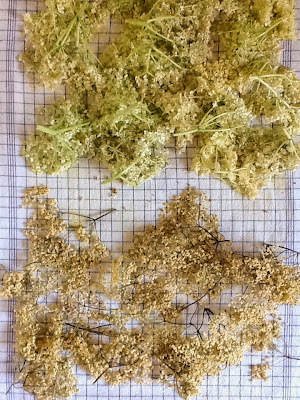 It is also possible to dry the elderflowers for later use. Keep them in a paper bag in a cool, dry place after drying. Posted in Preservation. Tags: citric acid, elderflower, sugar on 21/06/2014 by Maagedeli.